Our mission is to advocate, educate, and entertain ourselves and our viewers on the energies and topics of esports and gaming cultures as well as support our teams and the games we love in the state of Oklahoma. This website now functions as the home of the OU Esports Club and will have a news and media outlet emphasis. However, our entire programming infrastructure and development details will also be hosted throughout the various pages. 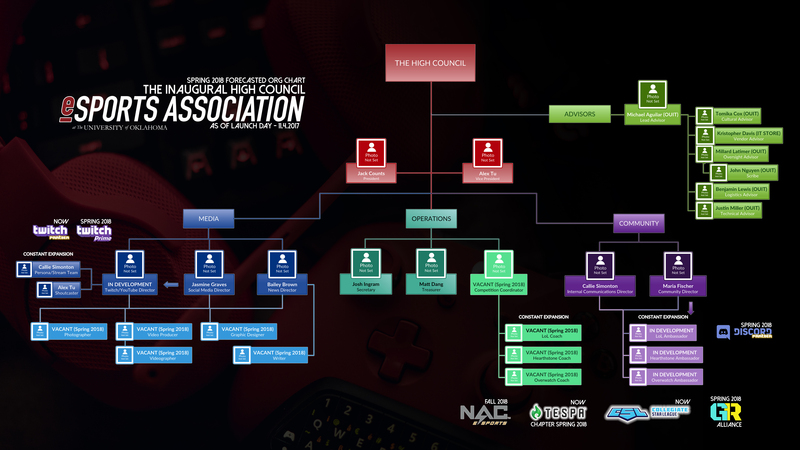 This organization was granted officially licensed “Competitive Club” status in November 2018 effectively changing our name from The Esports Association at The University of Oklahoma to The University of Oklahoma Esports Club or OU Esports Club for short. This organization is departmentally sponsored by The University of Oklahoma Information Technology department. Sooner Esports represents a research and practicum initiative from our parent organization, The OU Esports Club. Many things are being developed and investigated at OU in the context of the industry of esports and gaming. We’re excited about these opportunities and hopefully, we can keep your attention as we unfold all of our broad and narrow initiatives coming out of this organization on our journey for further formalization at OU and in our state. We have many different focuses and this website represents a big one with both news and streaming. Having the culture and environment of a university as the backbone of all this research and opportunity, we are heading down the paths of education, curriculum evolution, practicum demonstration, as well as intercollegiate competitive development as an organization all while building community inside and outside of the walls of OU. The massive parent industry of gaming, as well as the rapidly growing esports segment, are producing more and more job opportunities which mimic a lot of the infrastructure we see in conventional sports entertainment. Our goal is to leave no door unopened and every corner explored as we both influence and play specifically inside the collegiate segment of esports. This website will continuously evolve throughout every semester as we add focus, cover various newsworthy topics, stream, add resources, add teams members, mature programming, add events, and gain further formalization. We hope you become a follower and supporter of our goals as we try to bring topics to light, discuss them, and advocate for the vast opportunities that gaming and esports can represent. If you are a current or future University of Oklahoma student and are interested in joining our organization for community, competition, and/or news and media opportunities please go to our parent organization’s website HERE. This requires an OUID and 4×4 login credentials for initial verification. We are showcasing the teaser video to our upcoming documentary series developed and produced by student members of our Media & News team completely on their own accord. A serious moment of pride as we start to advocate for our cause and purpose. Our development is broken into 6 programs all with tangible programming for either OU students or the general public. Please read the general overview of each and click on each if you’d like more information. Focused on providing programming for OU students as a priority with extensions for mid-level leadership roles called “Ambassadors”. Additionally, has energies in community outreach in K-12, at-risk youth, and public event programming. Our primary journalistic energies. Writers, reviewers, opinion presenters, photographers, videographers, and event coverage. This program takes all the core energies in journalistic curriculum and industry and gives it a new opportunity at OU to present on multiple fronts with a dynamic pool of skillsets. Our focused developments on shoutcasting (sportscasting) emphasizing real-time analysis, color-casting, and a gradual elevation in production value to showcase our official teams and provide coverage digitally and physically to bring everyone the exciting play by play analysis during our matches. Our focused developments on variety and entertainment streams highlight the vast diversity of gaming cultures and subcultures. Think talk shows, real-time casual gameplay, watch key personas in our organization play various games, and so much more. This section of the about provides top-level analytical snapshots of our organization as a whole. Highlighting our leadership numbers, gender, discipline, and class breakdowns, organizational chart, and eventually some other things. Our current student members will always reset on July 1 each year to ensure we have proper reporting analytics for 3rd parties and administration.